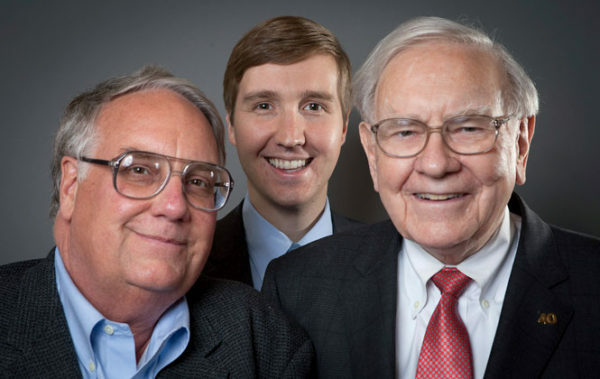 Howard, Warren Buffett’s farmer son, is one man, a rich one man, working in all 54 African countries developing sustainable farming on the continent with the biggest problems in hunger, poverty, soil, infrastructure, economics and politics. 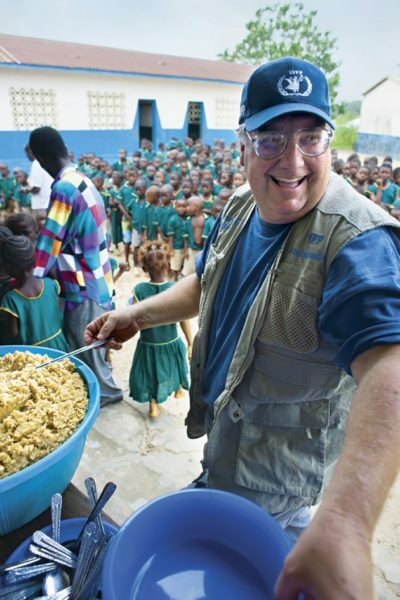 Howard’s dad is bridge buddies with Bill Gates who is also saving Africa. There is hope in 2016 that the Bern fires up the base like Teddy Roosevelt and FDR, while the well informed Buffett Gates partnership puts their money where it’s needed – like not in Panama. 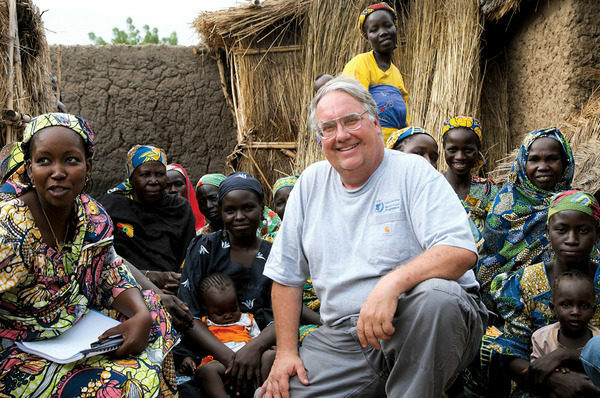 Established in 1999, his Howard G. Buffett Foundation’s (HGBF) primary mission is to improve the standard of living and quality of life for the world’s most impoverished and marginalized populations. It apparently spends $50 million a year on various programs around the world, particularly in Africa. Not surprisingly one of his biggest projects is improving lives of poor farmers, themselves often starving. His goal is to help teach them methods that they can afford to implement after his programs end. He also insists they learn accounting. “Your father gives money to Gates. You come out and say it’s all wrong. Is this sibling rivalry?” asked Stahl. 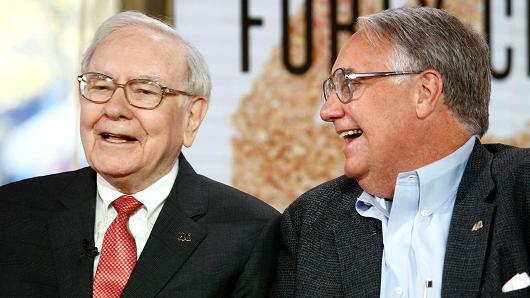 Gates and Buffett, the country’s two richest men, have become good friends, often playing bridge, celebrating birthdays and traveling together on vacations. Howard responded that Bill, who they call brother Bill, is the smartest guy in the world besides his dad, but pointed out that he understands agriculture quite well and had used a similar approach unsuccessfully when first starting to give away money. Some details about Howard that Stahl didn’t cover include the fact that Buffett’s son is a writer of more than half a dozen books; sits on the board of Sloan Implement, a privately owned distributor of John Deere agricultural equipment; and also previously served on the boards of food processor Archer Daniels ADM +0.74% Midland; Coca-Cola Enterprises Inc, the largest Coca-Cola bottler in the world; and ConAgra Foods. He has also traveled to more than 95 countries documenting the food and conservation challenges. In 2005, he received the Will Owen Jones Distinguished Journalist of the Year Award, and in 2007, he was appointed a United Nations Goodwill Ambassador Against Hunger on behalf of the World Food Programme. In 2011, he received the World Ecology Award. It could be a long time before Howard succeeds his father – “He won’t leave until he’s buried in the ground,” Howard told Stahl – and even longer before anyone knows if he proves to be a decent successor. Still he’s certainly proven himself to be a worthy scion of an admirable man, one who has his feet firmly planted in the earth. 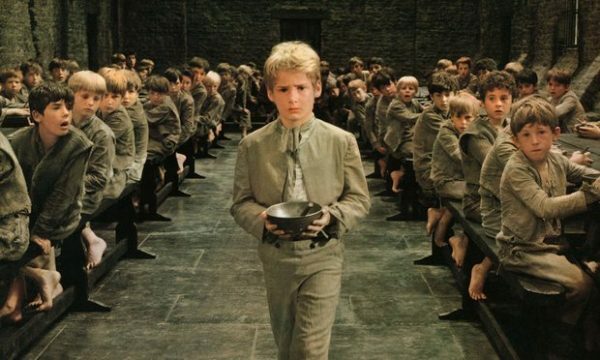 Revealed: how thieves skimmed the workhouse orphans’ cream. Unearthed documents show how Foundling Hospital children were robbed of full milk ration. Children should drink full-fat milk until the age of at least six, research suggests – as they are likely to grow up slimmer. 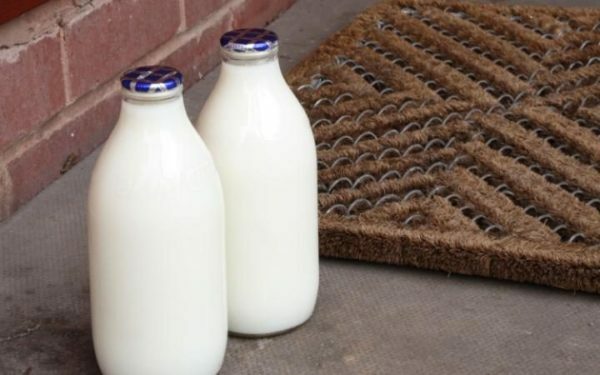 In recent years, the Food Standards Agency (FSA) has recommended that toddlers switch to semi-skimmed milk from the age of two, as part of efforts to prevent obesity. But research on more than 2,700 children found those given full-fat versions ended up with a significantly lower body mass index than those given semi-skimmed varieties. Those taking part in the Canadian study were also found to have higher levels of vitamin D, which protects the bones and immune system. For decades, children in Britain were encouraged to drink full-fat milk, as part of post-war efforts to build the nation’s health. But in 2009, the FSA warned that children were now consuming so much fat that it was clogging their arteries. Parents are now advised to switch their children to semi-skimmed milk from the age of two. The new research suggests such efforts could be counter-productive. Children who drank full-fat milk were likely to end up less hungry, researchers suggested, making them less likely to snack on high calorie foods. The Canadian research, published in the American Journal of Clinical Nutrition, found that those children who drank whole milk had a Body Mass Index score that was 0.72 units lower than those who drank one or two per cent semi-skimmed milk. Lead researcher Dr Jonathon Maguire, a pediatrician at St Michael’s Hospital in Toronto, said the difference amounted to the difference between having a healthy weight and being overweight. Children who drank one cup of whole milk each day had comparable vitamin D levels to those drinking nearly three times as much skimmed milk, the study found. This could be because vitamin D is fat soluble, meaning it dissolves in fat rather than water. As I was pontificating about how you could have an urban income and a rural lifestyle by raising 50 goats on five acres, my fellow teachers were educating others on Permaculture. Not wanting to expose my blissful state of ignorance to embarrassment I avoided my right of tuition free class attendance. However, Shelby, the sustainable agriculture and “Five Acres to Independence” advocate, took their course including the farm visit. When Shelby raved about the farm’s sawdust toilet I discounted Permaculture, whatever it was about was not for me. Currently living the expat life of the idle Social Security recipient in Antalya, Turkey I’m more interested in the debate between Fiscal and Monetary policy. Slow learner that I am, I have learned that the government deals with the Fiscal while the Federal Reserve monkey’s around with the Monetary. The debate synopsis is that the world and the US are going to hell in a sawdust toilet. 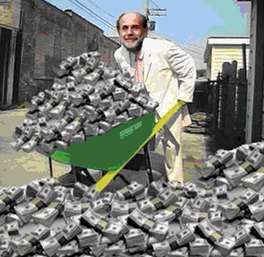 The FED since Greenspan has printed at least $10 trillion of ‘thin-air’ paper money with zero results and is now begging the politicians for Fiscal stimulus in Infrastructure. Trump is right there with them wanting to build walls, bridges and airports. Since 80% of the voters live in the city and another 19% live in the burbs the real 1%’s are still down on the farm. 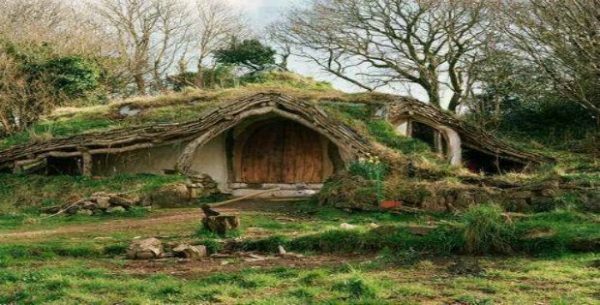 Alas alack rural redmeat farmers didn’t take classes in Permaculture, let alone practice Regenerative Agriculture because the Fiscal poohbahs don’t see the NEED! A group of Karakul sheep. 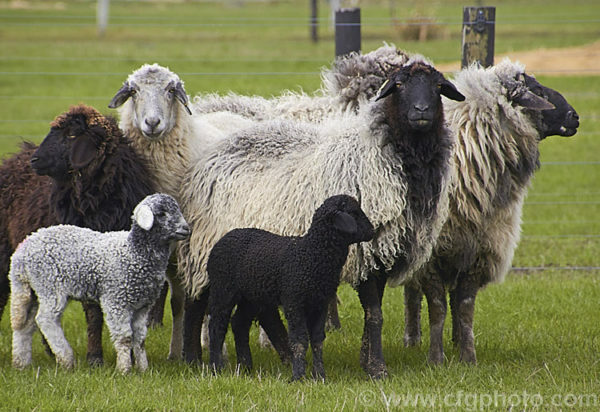 The lambs are born black but soon develop the variable adult coloration. The Karakul is a Central Asian fat-tailed sheep breed with a almost goat-like fleece and an ability to withstand heat and drought. Similar animals can be traced as far back as 1400BC and the Karakul may well be the oldest breed of domestic sheep. The breed is named after Karakul or Qaraqul, a city in Bukhara, Uzbekistan, near the Caspian and Aral Seas. 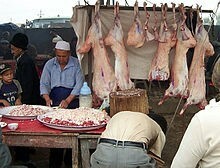 All parts of the animal – milk, meat, fat, wool and pelt – have their uses. 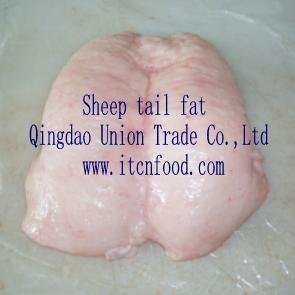 The fat-tailed sheep is a general type of domestic sheep known for their distinctive large tails and hindquarters. Fat-tailed sheep breeds comprise approximately 25% of the world sheep population, and are commonly found in northern parts of Africa, the Middle East, Pakistan, Afghanistan, Iran, North India, Western China, Somalia and Central Asia. The earliest record of this sheep variety is found in ancient Uruk (3000 BC) and Ur (2400 BC) on stone vessels and mosaics. Another early reference is found in the Bible (Leviticus 3:9), where a sacrificial offering is described which includes the tail fat of sheep. Sheep were specifically bred for the unique quality of the fat stored in the tail area and the fat (called Elyah, Arabic: ألية ) was used extensively in medieval Arab and Persian cookery. The tail fat is still used in modern cookery, though there has been a reported decline, with other types of fat and oils having increased in popularity. 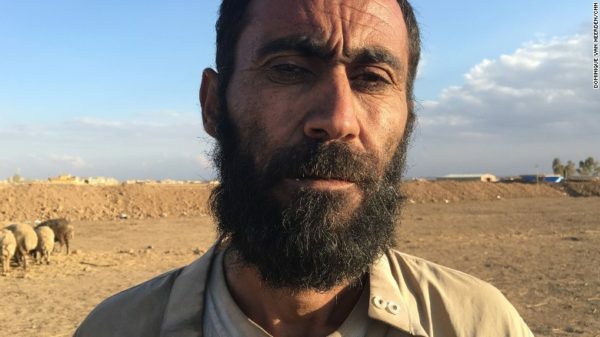 Before ISIS, he would get $130 per sheep, selling up to 50 a month ($6,500). Today he’s forced to offer a pair for $200. 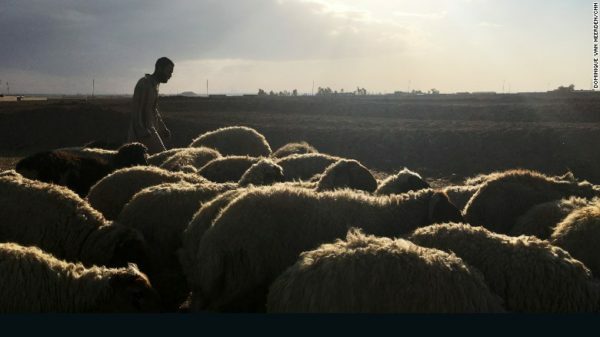 A 45-year-old shepherd Shukar Mahmoud is stuck at a checkpoint with his flock. 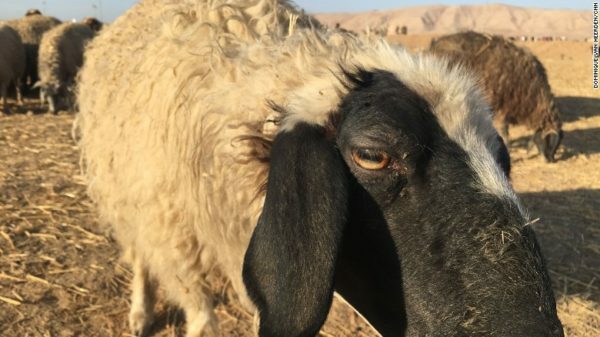 The Kurdish guards won’t let Mahmoud past their checkpoint to sell his sheep in their areas because they say they’re “Arab sheep.” It’s not an official rule. It’s just the rule today. Behind Shakur Mahmoud, the danger he fled; ahead a kind-of “sectarian bureaucracy.” Beyond the checkpoint, there’s a camp for displaced people where Mahmoud’s family waits for him, but for now this is where his journey ends. Though he has — literally — run for his life, he’s not leaving his sheep behind. Fat-tailed sheep are hardy and adaptable, able to withstand the tough challenges of desert life. When feed is plentiful and parasites not a major factor, fat-tailed sheep can be large in size and growth. The carcass quality of these sheep is quite good, with most of the fat concentrated in the tail area – it could account for as much as 10 pounds (4.5 kilograms) of the weight on a 60-pound (27 kilogram) carcass. The fat-tailed breeds seen frequently in the US are the Karakul and Tunis. The wool from fat-tailed breeds is usually coarse and frequently has colored fibers. It would be of limited value in commercial markets. Today it is used primarily for rug-making and other cottage-type industries. Bedouin women make rugs and blankets from the wool. Some of their handiwork can be purchased in the villages of Egypt. Shearing in Egypt is done once or twice a year with hand clippers. There is a reluctance to use electric shears because of wool quality and the difficulty in getting replacement parts when they become dull or worn out. My Palestinian goat vendor in Katy and I were trying to offload our “Two-toothed” goats on the Pakistani, Egyptian, Muslim community of Houston for $1.25/lb. The Egyptians especially kept bugging us about “sheeps with fat tail,” I said I know, I know, every place I went in my USAID Egyptian Ag-Research visits they had those, but we don’t have them in Texas. The Philistine researched the fat-tail and vowed next year to use the goats as a loss-leader to auction off Karakul’s with a minimum opening bid of $5.00 a pound.